Sandra Ondraschek-Norris is a visual artist, originally from Ireland, who now lives in the greater Zürich area. 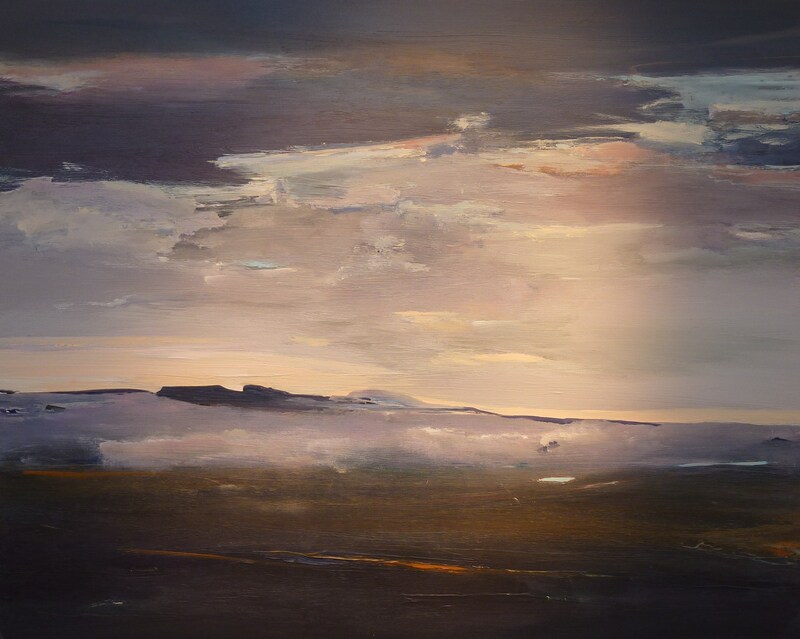 She is known for her landscape paintings, at once both confining and infinite; a source of melancholy and possibility. Libby O’Loghlin asks her about success, and about working with a visual medium—outside the realm of words. Tell us a bit about how you found your way to the visual arts, having started your career working in psychology and counselling. I did want to study art but fear combined with lousy career guidance got in the way. I think the adults around me at that time had a very limited concept of what art was about or what kind of job it might lead to. There was a sort of unspoken ‘painters die poor and lonely in a cold attic studio’ vibe. I’m not sure that their image of psychologists was that much better but I suspect that scenario might at least have included a room with heating. I’ve said previously that at that stage in my life, the urge to understand was greater than the urge to create/express. At some point, some years later, things were simply the other way round. During my training as a counsellor, there was a lot of emphasis on self-awareness, dealing with your baggage—cleaning up one’s own backyard and so on. The red thread in all of my baggage was not expressing myself, not being creative, not using my whole brain or indeed my hands. There was a gradual development from psychology in an academic sense to more alternative and holistic approaches that included ‘flow’ and energy psychology. I was also very interested—and continue to be fascinated by—self-management and resilience, and how people look after themselves—or don’t. I realised that denying myself a creative life was bad for my health. And that I am happier and calmer when painting is part of my routine. The experience of looking at a painting—and indeed the process of painting itself—is often out of the realm of language. Your paintings in particular are very evocative and tend towards abstract. What crossovers (or counterpoints) are there between your work as a psychologist and your work as a painter, in this regard? When I paint landscapes it’s definitely more about painting what I feel than what I see. That’s why I never work form photographs. One of my favourite painters, Caspar David Friedrich (1774-1840) said, “painters should paint not only what they see in front of them, but also what they see inside themselves. If they see nothing within, then they should refrain from painting what is in front of them.” I love this quote because it captures the essence of what painting is about for me. In that sense, the key crossover between the two fields is the role of emotions and the unconscious. Using art in a therapeutic setting can enable people to access emotions and deal with problems in a way that is often more playful, less painful and significantly faster than conversations. Having said that, I am a big fan of narrative and storytelling and poetry so I love to exploit all of these and to really draw on both sides of the brain. On your website, there is mention of the way “Aboriginal artists purportedly create, walk away and move onto something new”, “foregoing the urge to explain or rationalise after the fact”. Can you explain a bit about these concepts? Do they tie in with your definition of success as a visual artist? This question links to the previous one where you spoke about things being ‘outside of the realm of language’. I’ve read about art projects in Aboriginal communities where westerners were disappointed by the fact that artists did not seem interested in talking about their paintings. I found this quite entertaining and refreshing. We draw and paint long before we know there is something called an artist and long before we can explain what it is we are doing and why we are doing it. It’s also about detachment. People I admire (not just in the art world) typically have a healthy mixture of passion and distance. People I consider to be role models usually combine passion and dedication (to their craft/subject/profession) with humility and a reluctance to take themselves too seriously. I like the Buddhist quote, ‘behave as if your actions will affect the future of the universe and laugh at yourself for thinking this is possible’. As for success, I see it as being able to spend as much time as possible doing what you love and being as oblivious as you possibly can to other people’s notions of how you should live your life. Zadie Smith once said (of writing) “Resign yourself to the lifelong sadness that comes from never ­being satisfied.” Do think this is a part of the creative experience in general? Do you experience this with painting? I can relate to this; it’s not always sadness but I recognize the sense of never being satisfied and it may well be something that is inherent in the creative process. You create or express something that is deeply personal and then you put it out there for people to react to. Either it moves them or it doesn’t and you have no influence over that. However, I think the lifelong sadness that would arise from not painting would be greater (for me personally) so I think as long as the ‘never being satisfied’ includes ‘doing it anyway’, that’s ok. What’s not ok is avoiding doing anything because you would not be satisfied with what you produce. What would be your advice to those who work in so-called ‘creative industries’, when it comes to making a living? Have a routine. Flaubert said ‘be regular and orderly in your life so that you may be ‘violent’ and original in your work [art]’. I recommend reading Manage your Day to Day: Build your Routine, Find your Focus and Sharpen your Creative Mind, edited by Jocelyn K Glei. What interests you at the moment, and in what way is that feeding into your work? Trying to follow the advice I have given in answer to your previous question. Seriously though, I have become very interested in botanical themes. I risk becoming obsessed with patterns and shapes in plants. It’s slowing down my gardening considerably. And reading The Signature of All Things by Elizabeth Gilbert (a historical novel about a nineteenth century female botanist) hasn’t helped. My aim is to produce a collection that is completely free of landscapes. 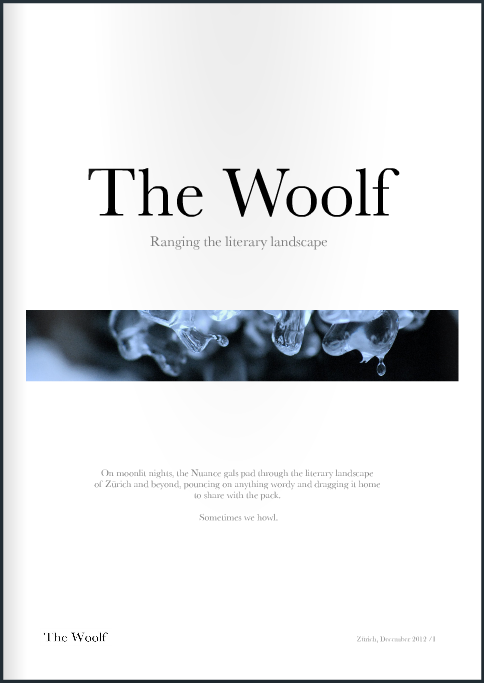 And The Woolf Special Question: What is your favourite work of fiction, and why? This is an impossible question to answer! It’s like being asked to say what my favourite painting is—or who my favourite artist is. Works that have stood out over the years: Brave New World by Aldous Huxley. Animal Farm by George Orwell. Pride and Prejudice. I love books that are written from the perspective of an ‘outsider’ like The Curious Incident of The Dog in the Night-Time, by Mark Haddon. Or The Woman Who Dived into the Heart of the World by Sabina Berman. If you force me to pick one all-time favourite: Alice’s Adventures in Wonderland and Through the Looking-Glass. I love the absurdity of the characters, the scenarios and the dialogue. * The reference here is, ‘don’t ask us for stories’ or ‘I don’t talk story like that’. An anthropologist called Ute Eickelkamp did research with Aboriginal people in Central and South Australia, and noted: ‘my special interest is in symbolic productions of sorts, art, play, ritual, dreams—with a view to understanding what Castoriadis has called the social imaginary.’ Without imagination, there is no reality.